Prenatal yoga is an essential tool for pregnant women who are interested in natural means for staying healthy and preparing for birth. Practicing yoga during pregnancy alleviates some common pregnancy discomforts. As Marie Mongan, author of the book HypnoBirthing, says, “When you change the way you view birth, the way you birth will change.” This is certainly true of yogis who dedicate their prenatal yoga practice to connecting with their baby while in utero and preparing for their baby’s arrival. 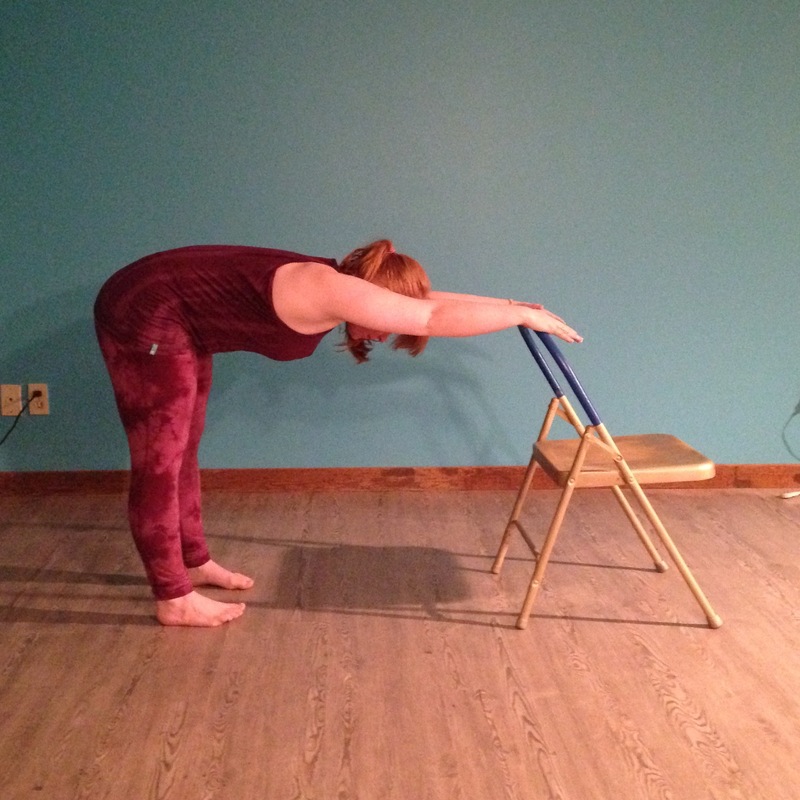 In this article, we’ll explore five yoga poses that can all be practiced using a chair. 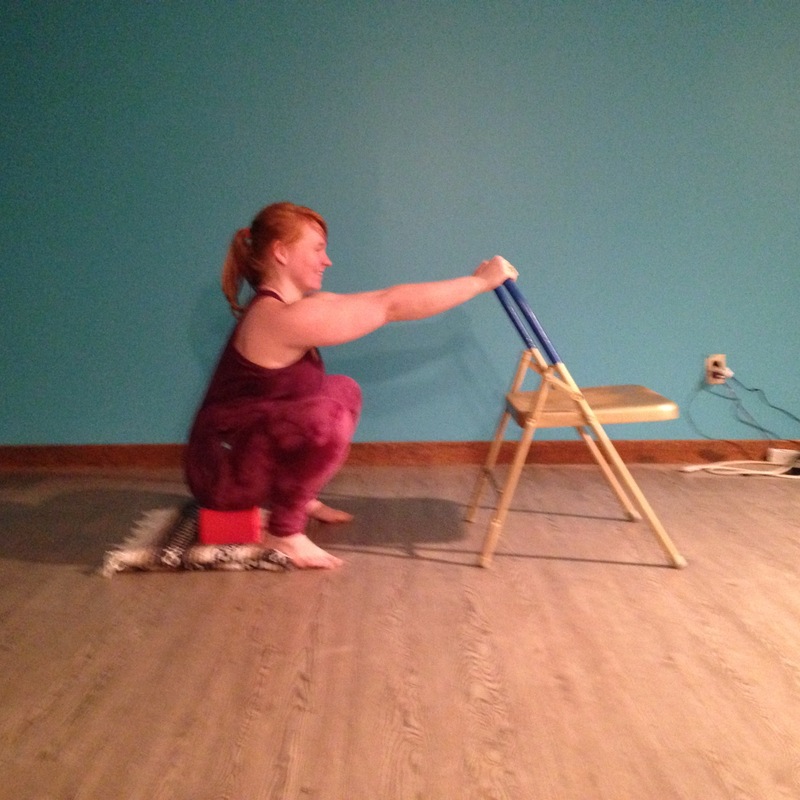 These chair poses are beneficial for the mama-to-be because they can be done safely with support and are accessible throughout the day, especially for working mothers who are unable to catch their favorite prenatal class each week. The setup: Place your hands on the back of a chair rim with the seat facing away from you. Step your feet back until your torso and legs create a 90-degree angle at the hips. Your feet can be hip distance or wider to accommodate space for baby. Push your hands down on the chair as you move your hips back. You can hold this pose for a few breaths and also try swaying the hips slowly side to side to lengthen the sides of the waist. Why this pose? Downward Facing Dog is a fantastic pose to stretch the muscles of the back and hamstrings. In its traditional form, it isn’t the most beginner-or 30-week-pregnant-body-friendly pose. Traditional Downward Facing Dog can be challenging for the wrists and the lower back. It can feel confining as mama’s belly grows. The chair version can be done anywhere (replace the chair for a dresser, counter, desk, etc). It is more accessible and less demanding on already pregnancy-sensitive areas of the body. This version lengthens the sides of the body; facilitates deep breathing; stretches the backs of the legs, which can become stiffer during pregnancy; releases pelvic pressure and lengthens the spine. The Set Up: Stand with your feet about 1 foot away from the front of the chair seat and hip bone distance apart. Shift your weight back into your heels and slowly hinge back at your hips as if to sit in the chair. Hover your buttocks about an inch above the chair seat and if you need to rest, the chair is there to support you. Be mindful that you are moving through the ischial tuberosities (sitting bones) rather than moving downward by bending at the knee joints. Feel the outer hip muscles and buttocks engage as you press down through your heels. Hold here for 10 to 30 seconds then straighten your legs by pressing down through the heels. Why this pose? Stability is absolutely essential in pregnancy. Relaxin is a hormone released by the placenta that prepares the body for birth by relaxing the muscles and ligaments, particularly around the pelvis. Relaxin helps to separate the bones of the pelvis in order for baby to move successfully down and out through the pelvis. This hormone destabilizes the pelvis, leaving mom feeling pain in her hips and rather vulnerable to injury in the months leading up to giving birth. In yoga, constant stretching could cause further joint instability and be injurious. By strengthening the muscles that stabilize the hips, pelvic pain diminishes and the structure of the joint is protected. The setup: Stand with your feet a few inches wider than your hips with a blanket under your heels. Hold onto the back of the chair standing about a foot away. Keeping your heels down on the blanket, bend your knees and squat down towards the floor. For extra support, place a block or bolster under your buttocks to squat down on. Why this pose? Squats are one of the best poses to practice for optimal fetal positioning and giving birth. Squats help to release the lower back muscles and the pelvic floor muscles. Understanding what it feels like to be able to relax your pelvic floor prior to giving birth is helpful for an easier natural birth. That’s not something you want to try to learn the day you deliver baby! Squatting during birth can assist baby to descend through the birth canal, give him/her more space than any other birthing position. The pelvic outlet is at its widest while squatting rather than lying on down. 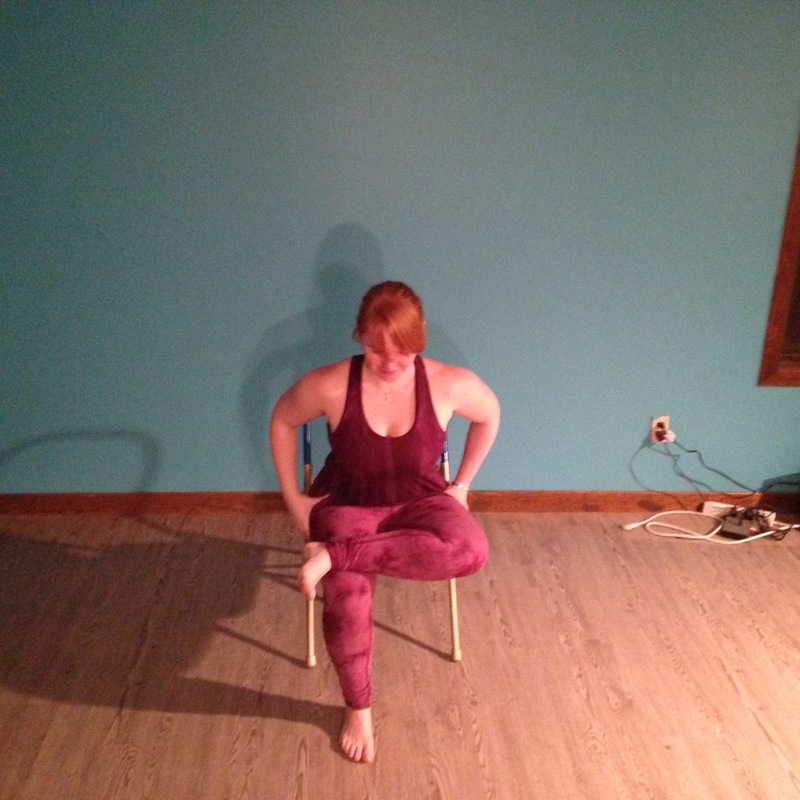 The setup: Sit on the chair with your feet supported on the floor or blocks. Cross your right ankle past your left thigh. Flex the right foot. Place your right hand thumb on your right hip crease where your upper thigh meets the pelvis and press down. Stay here or hinge forward at the hips slightly, allowing baby to move towards the triangle of space between your legs. Make sure not to compress your belly as your fold forward to make sure you’re not pressing on your baby. Why this pose? The piriformis muscle can become aggravated during the stages of pregnancy and also while trying to strengthen the muscles around the hips for stability. This seated variation of pigeon releases the piriformis and other muscles along the hips as well as the inner thigh muscles. The setup: You may need assistance with this setup. Lie on your back with your knees bent and the soles of your feet on the floor. 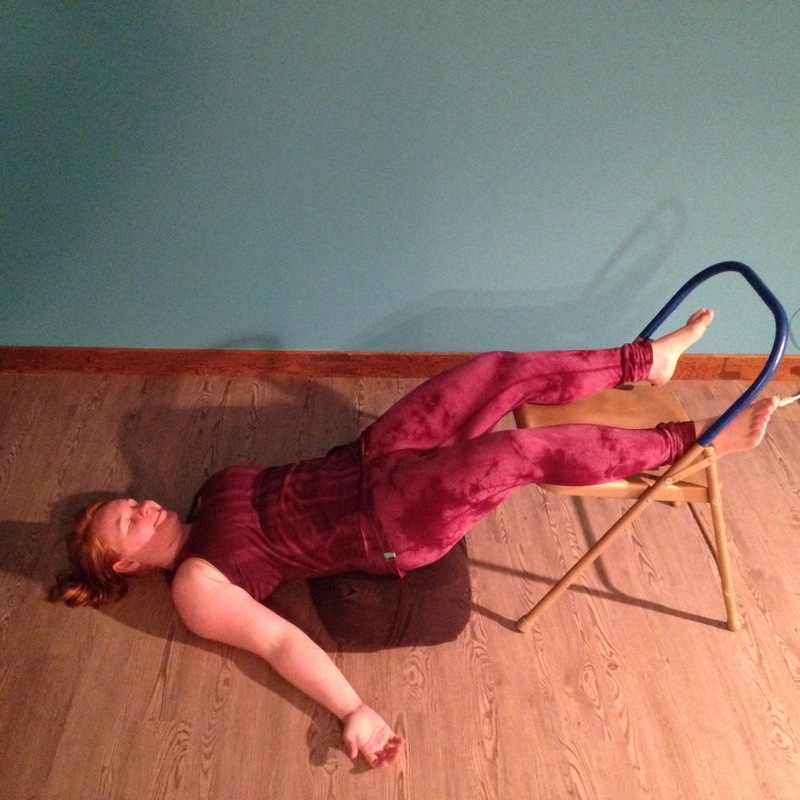 Lift your hips up and slide a bolster underneath your hips (someone can help with this). Have your helper standing by as you lift your feet one at a time and place the backs of your legs on the chair seat. Your calves should be supported and the feet may dangle off of the chair. Rest your arms down by your sides or wrapped around baby. Stay here for 2-10 minutes, working up to the longer duration. Why this pose? Legs up the chair is a great pose to help with swelling in the legs and ankles. By lifting the hips up, you may take some pressure off the pelvis, relieving pain, and this slight inversion can be calming. This pose is supported, which enables you to rest in it longer, offering your body some time to reenergize and focus on your connection with baby. Don’t be surprised if you feel baby waking up as you are resting. In the later stages of pregnancy, lying on your back may not be comfortable for long periods. Make sure to listen to your body to gauge when to come out of this pose or whether it feels appropriate to do it at all. These five poses can be practiced singularly, or as a miniature prenatal sequence as listed above. Having the tools to alleviate some of the common discomforts of pregnancy is empowering and by practicing these positions, your body and mind are inherently preparing for the birth of your new addition. Furthermore, studies have shown that expecting mothers who participate in prenatal yoga have fewer medical complications and interventions, reduced pain during delivery, reduced pelvic pain and improved moods. It is noted that further research should be performed in this area but it is a hopeful sign that yoga is a natural and proven method to benefit a woman’s pregnancy. Jane Weideman sums up the meaning of birth nicely as, “Giving birth should be your greatest achievement, not your greatest fear.” Trust your innate ability to give birth and use methods like prenatal yoga that support your ability to understand what your body needs and what it is capable of doing. Another article from YogaUOnline about prenatal yoga - Studies Show Consistent Benefits of Prenatal Yoga. Study with Sue Elkind and YogaUOnline - Prenatal Yoga Essentials for a Healthy Pregnancy and Birth. Allison Schleck, E-RYT 500, RPYT is a vinyasa based yoga teacher, fascinated by the intricate relationship between the mind and body. She offers a range of alignment-focused classes touching on anatomy, philosophy and creative propping with a mindful approach. 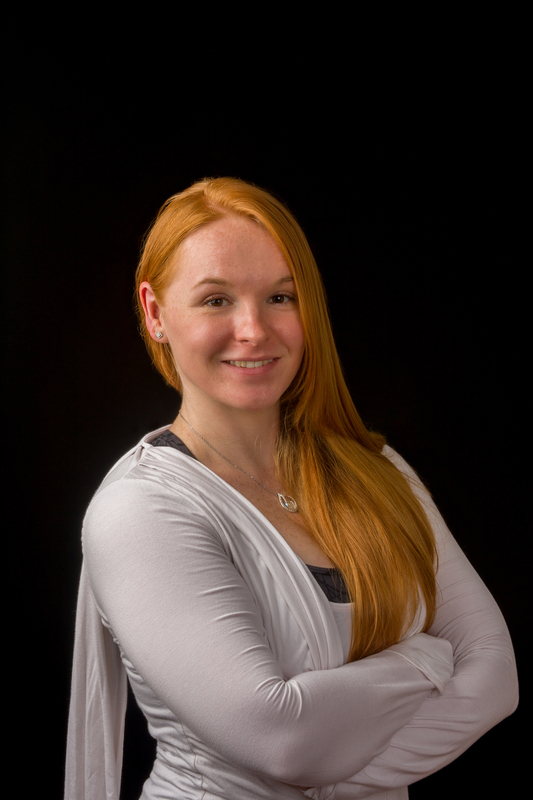 In addition to teaching group classes and managing the Yoga Culture studio in Danbury, CT, she also teaches at Open Door Family Medical Center in Westchester, NY empowering mother's to be with prenatal yoga classes and childbirth education. You can find her @allisonschleck on instagram and www.allisonyoganidra.com.